Fancy feast gourmet cat food is good enough for us to eat or at least it sounds that way: "Grilled Beef Feast in gravy. Made with slow-cooked beef feast lavishly basted in gravy......". I sounds like the kind of thing I would knock up at Christmas - for myself! And that is the point. Our cats are silent. Our cats have no thoughts about the niceties of grilled or steamed foods packed in deliciously cute little lined cans with easy pull lids. If it smells good and tastes good they will eat it if they are hungry. It is down to us to make sure that it is good. And we shouldn't really decide on the basis that it sounds tasty to us. Do you sometimes have the urge to lick your fingers when you have pealed back the lid of a can of gourmet cat food and served it up to your cat? The marketing of modern gourmet cat food is not cat-led. It is designed to be attractive to us. As a member of the family many good cat caretakers want to do their best for their cats. They also like to give their cats a nice feast when they themselves are participating in a special meal on a special occasion. That is nice but the marketing departments of cat food manufacturers know this and they know that we tend to anthropomorphosize our cats so human and cat food merges. I just think that we should be aware of this and stick to what is good for our cat and think like a cat (I am not saying Fancy Feast gourmet cat food is not good; just that the term "gourmet" etc. does not mean that it is necessarily better). Gourmet cat food is expensive, particularly in the UK and it is no better than less expensive food. 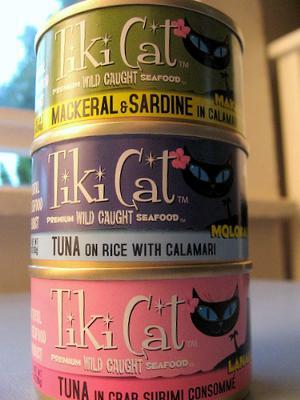 Gourmet cat food is often packaged in small paté-like-cans. This increases the packaging requirements to the detriment of the environment. A small thing some people might argue but a point that we should all be more aware of today in a world were we should think about reducing our carbon footprint. The packaging of cat food is quite extensive if we think about it - tons of cardboard and tins etc. It is argued that one reason for the rise in gourmet cat food sales is the breakdown of the family, working longer hours has resulted in a greater attachment to our cats. Cats are wonderfully reliable and predicable companions. People want to do their best for their companions and rightly so. We should just remind ourselves that gourmet cat food is not necessarily the best. In any case, my cats don't like it! They prefer good quality, yes, but they care not for a fine rabbit terrine steamed slowly in a Moroccan oven....! Umm where's my toast, I could do with some of that. I have heard some good comments on the Purina brands but the Whiskas and Me-O worries me. I am currently giving my Siamese Whiskas and she seems healthy enough with it, but she just got a little diarrhea recently and I'm wondering if that was due to the cat food or just too many Fiskies? I just commented on another page that after reading your article about the Purina Animal testing as to how we are trying to change our cat food. Fancy Feast by the way is made by Purina. Your picture of Tiki Cat is something we have tried. It was a little expensive and since we now have 5 cats couldnt afford it. Friskies also is made by Purina. Our cats dont care for Nine Lives. We are trying different small cans but Lia knows it not Fancy Feast even if he doesnt know I paid almost 1.00 for the can. I would like your recipie Joyce. I have tried some homemade chicken recipies and they eat it the first day because its new. After that forget it. They want something different every time. I spend a lot of time in the cat food aisle getting different flavors. But now about that Purina, Im stumped. What about NUtro Brand. I dont have my own computer so its hard for me to research. Nov 10, 2010 Gourmet Cat Food. In India, "cat Food" is available in packaaged form but it is 'Dogs" that are more in the news as well as forefront for exotic "Dog Food recipe's". A pet programme on "NDTV GOODTIMES(Indian T.v)" has a programme on pets called "Heavy Petting" which concerns mostly dogs and general animal welfare and care.This programme is sponsored by "Pedigree foods", the largest selling "Pet Food" company in India. On one of the programmes viewers were given a brief tour of the "Pedigree Factory" in India and i was surprised at the cleanliness and hygiene quality control of this factory, akin to a human Pharmaceutical factory. We were shown a detour of the different stages of preperation of "Dog Food" in the "Pedigree factory", both "Vegetarian and non-vegetarian dog food". "Vegetarian dog food" is very popular in india as ,anny dog owners are vegetarians and hence feed their pets only vegetarian food.In "Pedigree Factory" the staff themselves, including the director tastes the "Vegetarian processed dog food" after it is processed and packed to ensure proper quality control. After all, if the food is edible to humans then so also for the pets! Although the same would not be demonstrated for the "Non-veg Processed dog food", as i presume it would have some raw animal content. As for me, i feed my cats "Home processed non-veg food", although the cats have to be fed like children by my house-keeper, absolutely pampered pets.Viewers can vouch for their health from the photographs of queen cat matahari and tom cat matata, proof that home cooked food is as nutritious as packaged processed cat food.My cats are fed twice a day. Great article, Michael, as usual. Joyce, I admire your fortitude in making your own cat food, but be cognizant of your cat's nutritional needs, like turine, that you may have to add. Do you follow a specific cat recipe? I tried making my own, but it just didn't work out - mostly because I don't have the time so I went in search of good quality cat food that meets all of the required standards. What a surprise when I found out that a local store-bought brand had more nutrients than a name brand, at nearly 1/3 the cost! Sadie used to love seeing what I had to eat and would try a 'taste' of nearly everything, especially grilled chicken. Abby doesn't do that. She's satisfied with only 1-tablespoon of wet and 1/4 cup of her dry. Anything more and she loses interest - thankfully, since she's on a restricted regimine anyway to shed excess weight. The biggest thing I watch for is how the ingredients are listed. If it begins with the meat and not byproducts, grain and chemicals, the chances are it's OK. Comments? I can make a weeks worth for almost nothing and I know it's not full of preservatives or have to worry about a safety recall. You're right, as usual. The gourmet part is for the benefit of the owner.